mSupply now has a new Save Template feature which allows you to save a given report as a template once you have input your chosen settings. Templates can be reused as needed. You are able to save the preferences you have set as a template report. You can set a name and description for the report template. You can also define user permissions as ‘Public’ – for anyone, or ‘Private’, in which case the permissions only apply to the user who created the template. Displays all template reports that the user has permissions to view. 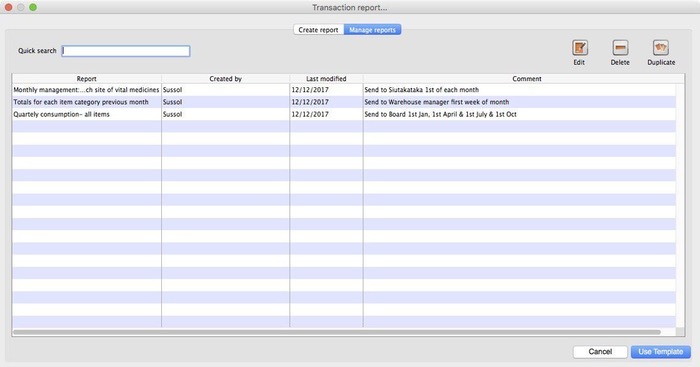 Users can also edit, delete, and duplicate the reports if user permissions allow. Quick search searches in all text columns of the table.